Is Beijing committing atrocities against the Falun Gong movement? 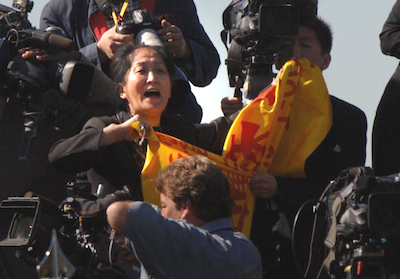 WANG WENYI, the woman whose shouts disrupted the welcoming ceremony for Chinese president Hu Jintao on the White House lawn on April 20, is a middle-aged pathologist and a follower of Falun Gong. That spiritual movement was outlawed in China in 1999, and since then Falun Gong has become a focal point for opposition to the Communist party. To that extent, Wang’s outburst was understandable. Less obvious was the connection between her profession and the raw intensity of her denunciation of “killing” by Hu’s China. As a doctor and a Falun Gong practitioner, Wang had to be incensed by a hair-raising story coming out of northeast China–of organ harvesting from live Falun Gong prisoners. The reports, which first appeared in print in the March 10 edition of the Falun Gong-associated publication Epoch Times, are still sketchy and confirmation scarce. Yet the allegations are just credible enough to demand attention–too serious to be ignored unless proven false. What’s more, recent work by the World Organization to Investigate the Persecution of Falun Gong, headquartered in Boston, has turned up some compelling corroboration. Here, then, is the narrative as it has emerged so far. Back in 1988, a hospital was constructed on a 21,087-square meter plot (about five acres) a few miles outside of Shenyang, in a satellite city called Sujiatun. It’s pronounced Soo-jah-tyun, and you might want get to know that name. It happened that the hospital–now the Liaoning Provincial Thrombosis Hospital of Integrated Chinese and Western Medicine–had a large basement and an inconspicuous back door. In 2001, some employees in the hospital’s accounting and logistics department noticed that the hospital’s requests for food, rubber gloves, toilet paper, and surgical equipment suddenly went way, way up. The food and surgical tools would disappear, the trash would get hauled away, yet it was unclear how they were being used. At one point in 2002, the accounting department estimated the logistical increase represented a whopping discrepancy of thousands of patients. One accountant–called Annie in the Falun Gong literature on the scandal–was aware of the supply mystery, but what concerned her far more was the behavior of her husband, a surgeon at Sujiatun. On the surface, the couple was doing fine. He was bringing home increasingly large amounts of cash, and his job appeared secure. The hospital had even issued him a dedicated cell-phone, which would ring at odd hours and send him back to Sujiatun. Yet when he came home to bed, he had violent nightmares and would wake bathed in sweat. During the day, he was constantly on edge, preoccupied, even fearful of his wife’s touch. It took a year, but eventually he confessed to her: The accounting staff was right. There were extra “patients” in the subterranean depths of the hospital, and some makeshift operating rooms down there, too. When his cell phone rang, it meant that a “patient” had been wheeled in and given a small dose of anesthesia (the hospital had a limited supply). Then he and the other doctors–some hired from the outside, each with a specialty, all constantly on call–would come in and remove the patient’s kidneys, skin tissue, corneas, and other organs, seemingly to order. The remains of the “patient” would then be carried down to the old boiler, which doubled as an incinerator. The workers who disposed of the bodies–sometimes still alive–helped themselves to the occasional watch, necklace, or ring as a kind of tip. The “patients”–men and women, old and young–were all Falun Gong practitioners. It was so much easier that way–no arrest warrants, no need for paper work. If a diagnosis had to be stipulated for some reason, the entry read “mentally destroyed,” and the cause of death “suicide.” The doctors’ silence was bought with generous financial rewards, the assurance that they were simply “cleansing” for the party, and the vague threat implicit in the observation that if you had already done some of these operations then what difference would a few more make? Buck up! The hospital is still operating, but the Falun Gong “patients” are apparently gone. The Chinese Communist party denies, of course, that they ever were there. More interesting, a recent U.S. consular visit found no cause for concern. The first account of the horrors at Sujiatun was provided by a Chinese reporter now in hiding in the United States, with whom I spoke briefly. He claims to have many sources, some of whom he paid, as is common in China. As for Annie, I interviewed her for ten minutes on April 20, after her first, rather chaotic, public appearance. She spoke at a rally at McPherson Square, a few blocks from the White House, to protest human rights abuses in China. Although our interview was hardly the six-hour session that I wanted, we were alone, apart from an interpreter, and could look each other in the eye. My strong impression was not of a Falun Gong devotee put up to a stunt, but of a classic accidental witness: pale, open-eyed, conscientious, and somewhat bewildered by Washington–a beautiful doctor’s wife sitting in the back of a van, telling the most explosive story in recent Chinese history. It must be noted that there are discrepancies between the Chinese reporter’s account and Annie’s. For example, he called Sujiatun a concentration camp at one point and spoke darkly of barbed wire and massive underground civil defense tunnels allegedly connected to the hospital. Annie portrayed Sujiatun as a regular hospital with a basement large enough to hold thousands of Falun Gong prisoners. The U.S. State Department states that its “officers were allowed to tour the entire facility and grounds and found no evidence that the site is being used for any function other than as a normal public hospital.” And for those who point out that you couldn’t clean up Auschwitz in three weeks–the time that elapsed between the publication of the story and the consular visit–the matter ends there. But, given the political sensitivities involved, particularly during a summit, I still have questions. Anyone who has lived in China knows that three weeks is a long time by Chinese construction standards. Is the State Department certain its officers toured an unaltered facility? Did they take an architect with them? Collect forensic samples? Sift through ashes? Interview any hospital personnel privately, off-site? And on their tour, did they reject the company of the inevitable CCP handler or hospital operative? If the answer to these questions is no, then the Americans’ findings are interesting but hardly dispositive. The visitors could easily have missed a walled-off underground facility. Experts have also pointed out that the Sujiatun hospital is prohibited by its legal classification from performing organ transplants in the first place. Yet Annie spoke of organ harvesting, not transplants. In any case, in the new entrepreneurial China, organ transplants at hospitals of a similar classification have been reported on Chinese state-controlled television, apparently without repercussions. These are all legitimate areas for inquiry–which is difficult in surveillance-rich China. Certainly, investigating Sujiatun would place any Beijing-based media bureau on a collision course with the CCP. No wonder Sujiatun has so far been covered in depth only by the Epoch Times, the same paper that acquired a press pass for Wang Wenyi. It has numerous Falun Gong practitioners on its staff and has become a magnet for Chinese dissidents of many stripes. Like the Jewish papers that published the first accounts of the Holocaust, the Epoch Times and the World Organization to Investigate the Persecution of Falun Gong have made this story their own. Q: I have to have a fresh and healthy kidney. And it should be alive. You are not going to give me a kidney from a dead person, are you? A: Of course we will give you a good kidney, how could we give you a bad one? Q: . . . Do you have ones from people who practice Falun Gong? I heard that they provide very good ones. A: All that we have here are of this type. Q: . . . Do live transplants, for example, use organs from live people who practice Falun Gong? Q: At your place, for example, prisoners, like those who practice Falun Gong, can you guarantee enough live supplies from such people? A: Yes, sure! When it’s convenient for you, come over and discuss the details. Now, given that many Chinese are consummate salesmen, could some of the responses be construed as simply attempts to please the customer? Perhaps. But the calls also turned up an unexpected timeline. Repeatedly, hospital representatives urged the potential customers to come in April when supplies would be plentiful, and got nervous when customers asked about May. Independently, unnamed sources in China have told the Epoch Times that after its story appeared on March 10, party authorities gave the hospitals until May 1 to end the practice (or at least make it untraceable). Finally, Yang’s team also placed a call to the workers in the boiler room of the Sujiatun hospital. The call confirmed that they burned bodies and had watches to sell. If it is true that imprisoned practitioners of Falun Gong are being murdered for their organs in China, a remaining question is the scale of the practice. The number of Falun Gong practitioners in custody is disputed; estimates by the Chinese dissident community range from 235,000 to one million or more. An unnamed military doctor from the mainland told Epoch Times that Sujiatun is one of 36 such facilities, created following the directive of Liu Jing, China’s former deputy minister of public security, to “stamp out” Falun Gong “before the Olympic Games in 2008.” And for several years now, rumors have circulated on the mainland of a death camp in Xinjiang capable of holding 50,000 Falun Gong practitioners. Personally, I fear the worst. One reason is that the Chinese authorities have always handled Falun Gong with a peculiar vehemence, even in comparison with other enemies of the CCP. When Falun Gong was declared illegal on July 21, 1999, ancient sound trucks drove around Beijing to make sure that no one missed the point. That’s unusual. At the time, I was working in Chinese television, and I remember the day well. Several of my Chinese colleagues began laughing nervously and buried their faces in their hands, muttering that they had not seen such a thing since the Cultural Revolution. Since then, Falun Gong participants have regularly disappeared, with no arrest record, nothing but an assigned number, leaving them particularly vulnerable. But the main reason I’m pessimistic is the money. Organ transplants are a profitable business. Until recently, a website out of Shenyang carried a price list for organ transplant operations in English to attract foreign customers, with a kidney transplant going for $62,000. And there is precedent; it is indisputable that the Chinese Communist party has sanctioned the sale of body parts from executed prisoners. As a former Beijing business consultant, I am familiar with the peculiar combination of state directive and entrepreneurial acumen pervasive in the New China. A directive comes from on high. The money is made down below. If the CCP orders tracking software, say, installed in Internet cafés across China, the local police will sell a version for $200 a pop, and every café had better purchase a copy. The May 1 shutdown will also be familiar to anyone who follows micropatterns of counterfeit enforcement in China. Chinese SWAT teams do not swoop down on illicit factories, even the ones that make fake Johnson & Johnson baby oil that causes skin rashes. Instead, plant managers are told to finish up their production runs and move their equipment elsewhere. So I suspect that the profits from Chinese organ harvesting dwarf those of the Nazis’ soap and hair-pillow-stuffing enterprises–but I also wonder whether they will prove the undoing of the CCP. Where there is money, there’s a trail. Epoch Times, in a rush to get the story out, neglected to pursue that line of investigation. What if its reporters had formed a front company that had gone in and inspected the stock of potential organ donors–wired-up, spy-cam, the works–and only then released the statements of witnesses like Annie for corroboration and color? What if they had persuaded Congress to order U.S. intelligence agencies to intercept financial transaction statements and monitor train and truck movements to and from the hospitals of China? No matter–that’s not how Epoch Times handled it, because that’s not the way real witnesses behave. Instead, when they are ready to come forward, they feel compelled to testify. And it’s not the way real people behave, either, when they believe that family, friends, and fellow congregants are being thrown into incinerators and when they see their own honorable profession grotesquely perverted. Instead, they scream bloody murder–just as Wang Wenyi did–and silently pray that someone is listening. Ethan Gutmann is the author of Losing the New China. He has been a frequent speaker at forums organized by the Falun Gong-associated publication Epoch Times. « Who Lost China’s Internet?